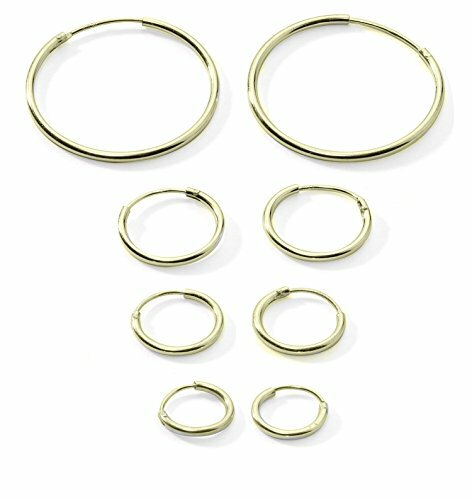 This Set includes 4 pairs of Endless Hoop Earrings. They're made from Solid Sterling Silver and comes Highly Polished. The Quality of these pieces of jewelry is excellent, and yet the price is very reasonable. They'll surely make an awesome gift for yourself or a loved one. Set Includes 925 Sterling Silver 4 Pairs of 4 Sizes 10mm 12mm 14mm 20mm Earrings at the Price of One, Affordable Price, Economical Set. Satisfaction Guaranteed: - Regetta Jewelers puts our customers FIRST! All of our jewelry come with a 100% Satisfaction Guarantee! If you have any questions about this product by Regetta Jewelry, contact us by completing and submitting the form below. If you are looking for a specif part number, please include it with your message.